This lacquer paper box (ryoshibako) is part of a writing set made by the Kyoto artist Tomita Kōshichi towards the end of the Meiji period (1868-1912). The boxes use a wide variety of lacquer techniques to achieve a range of textures. They are also stylistically very interesting as the landscape designs, with their spatial complexity and misty atmosphere, are highly reminiscent of the Nihonga style of painting that developed in the late 19th century, when Japan was emerging from over two centuries of national isolation. Nihonga (literally ‘Japanese painting’) aimed to preserve Eastern traditions while exploring the potential of artistic conventions and painting methods learnt from the West. 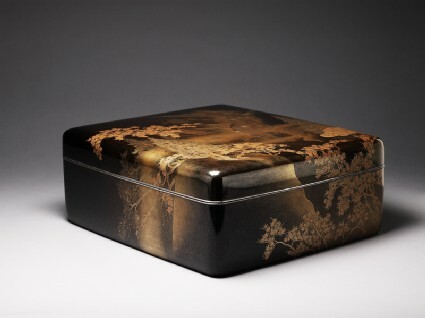 On the one hand, the subject matter of the boxes is highly traditional and full of Eastern symbolism: the seasons, representing the cycle of life and conveying the Buddhist sentiment of the transience of all things, have long been a favourite subject of Japanese art. Stylistically, the depiction of the rocks and waterfall recall Kano School ink painting, learned from Chinese Song and Yuan painting. On the other hand, the boxes have borrowed their sense of receding space and their depiction of atmospheric conditions from Western stylistic sources. Tomita won several awards at national and international exhibitions in the 1890s, and in 1901 he became a lecturer in the lacquer department of the Kyoto Art School. However, he died young and there are relatively few remaining works by him, of which this is one of the finest. Purchased with the assistance of the MLA/ V&A Fund, The Art Fund, and the Elias Ashmole Group, 2007.